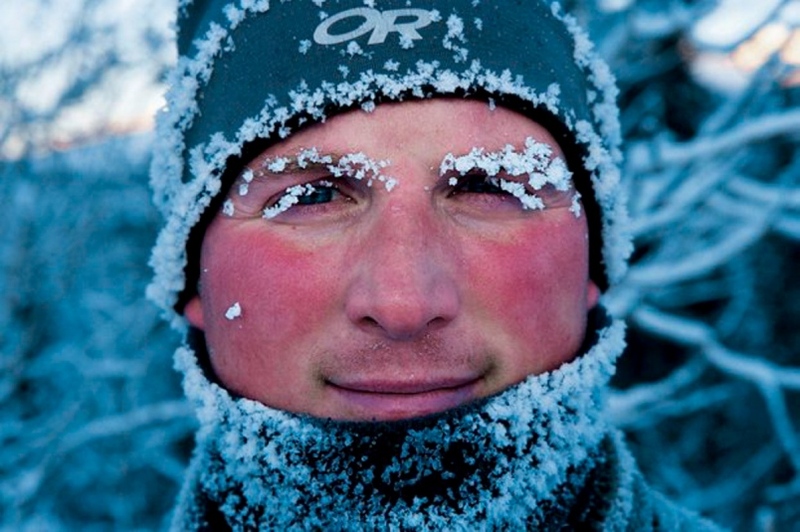 Rolling Stone talked with Nicklen about the changes in the Arctic he’s witnessed, what scares him the most (it might be the human animal), and what it’s like to camp out on the ice. As a kid, growing up where we lived in the Arctic, we didn’t even have a grocery store, we didn’t have a telephone, a radio. We didn’t have anything. But my mom had a darkroom. And she would shoot black-and-white film, and it would take three months to get those negatives processed. We’d have to ship them out on an airplane. And then when the film would eventually come back, it was just such a magical process to watch these beautiful black-and-white images appear. Inuit hunters out on the land, out on the ice, sort of capturing the culture, capturing the scenery, the beauty of it. I think that’s when it stuck to me. I was already in love with the Arctic, but it was just sort of like a new way of seeing. And then, when I went to University of Victoria, I saw they advertised this really intense scuba-diving course. I’m like, “What do you mean I can get a camera and go underwater and take pictures?” My invertebrate zoology professor was a world authority on the underwater marine ecosystems. And I remember coming back with some so-so pictures, and he was just blown away. He didn’t realize that’s sort of how it all looked down there. The fact that I was able to impress somebody of his caliber, somebody I really looked up to, just made me feel like, at the age of 18, I had a purpose in this world. How many people in the world do what you do, as far as diving in Arctic waters? There’s all these different ranges of ability, and risk-taking. It’s one thing to dive, to go scuba-diving anywhere. It’s another to go in the cold waters of British Columbia [where Nicklen lives], and it’s something altogether different to put on a rebreather, a closed-circuit rebreather, and then go under the ice for an hour. At that level, it becomes very, very extreme. I am trained in some of the hardest diving in the world. It seems like there’s multiple ways that you could die there. Yeah. We’ve had some scary moments. You learn a lot from those, and you just don’t take anything for granted, for sure. Is an hour the max amount of time you could spend in water like that because of the temperature? So, if you take water that’s 29 degrees Fahrenheit — which is basically as cold as salt water can get before it freezes — it’s like diving in this slushy soup. It’s burning cold. And you’ve got a wet hood, which means water gets in under your hood and onto your head. The idea is that Neoprene is supposed to warm up that water. I’d say the first three to four minutes, you start to lose all feeling in your face, your lips, your cheeks, whatever is exposed. And then I’d say after about 15 to 20 minutes you lose all feeling in your hands. You have to look at them on the shutter of your camera, and you can’t feel yourself, but you can hear your camera clicking. I’d say after about half an hour to 40 minutes, your body starts to shiver violently. And then you know you’re still OK, because your body is still functioning. And it’s when the shivering stops at about 55 minutes to an hour, maybe an hour and 10 minutes, that’s when everything starts to cramp up, everything stops working, and that’s when you’re entering the early phases of hypothermia. That’s when you start to enter the danger zone. And are you generally doing this by yourself? When you look at the best cave divers in the world, often they dive alone. And it’s the same with ice diving. Somebody else who’s less experienced becomes a liability. Generally, I want to be alone. I want the animals to interact with me. If I’ve got a big group of narwhals coming down the crack, you don’t want anybody else in the water, you want them to hopefully pass by you, and allow you to get that shot. How long are you usually out for a shoot at a time? So we’ll live on the sea ice for up to two months at a time. And that’s just the best way to get those shots. I see big film crews come in, and they’ll set up there for two weeks, and they’ll throw all their money at, sort of “Go big or go home.” Where my whole motto is, stay nimble, light, small, flexible, and save your money that way, but where you spend your money is just by allowing yourself to be there for months in one spot, waiting. Narwhals for example, I went back there every year for six years before I finally figured out how to film narwhals. And nobody else had ever figured it out either. In six years of trying, it came down to five hours, five good hours of shooting. And then that’s how we got our coverage. That’s sort of how it works in the Arctic. You just have to put in your time. You live on the sea ice. But the risk with that is that that ice is constantly breaking up and drifting out to sea. And so you could be moving your tent maybe every — I’ve moved my tent four times in one day. I’ve drifted out to sea on a pad of ice and had the tides bring me back. We were four miles offshore. Four miles out on the open ocean on a piece of ice, and then the tide switched and brought the ice back. We were very lucky. Other people have had to be rescued. I think you must be a master of not panicking. In diving, when you’re around animals like polar bears, or leopard seals, the only thing, almost ever, that can kill you is panic. So the more stressful it gets, the more calm you have to be. Do you think that’s because the animals react to that panic, or just that you’re not going to be thinking clearly and you won’t be able to make the best decision? Both. We have something called perceptual narrowing. The more panicked you get, the more narrow your focus is, the less able you are to think on your feet. I let these animals dictate the encounters. I never push them. I always act very calm. I rarely make eye contact with them. I just sit there very peacefully, and I let them go on about their day. And eventually, I’ll start introducing camera noises to the situation, and before you know it, you’re 30 feet away from a polar bear, just acting naturally as can be. And that’s when you’re in your dream situation. So is it fair to say that you’ve witnessed first-hand things no other human has witnessed? If you had to name your most harrowing moment with an animal, what do you think it would be? I’d say my biggest, scariest moment was getting in the water with a 7,000-pound breeding elephant seal bull, who had a harem of 300 females on the beach. These animals, they completely turn their brains off that time of year. They just go into full-on kill-or-breed mode. They kill and chase away every male that they can. And all of a sudden, here this big bull saw me in the water, and he came shooting over to me and just saw me as a competitor for his harem, and tried to crush me, tried to lunge at me. I had an assistant on the beach, but he was slow to react, and this elephant seal almost got me. It was almost a cathartic moment, because I’ve had a lot of close calls, but this was a moment where I was like, “Now I know I’m going to die.” But that was my mistake. Nobody had jumped in the water with a big breeding bull on purpose like that. I went and tried it, and it turned out not to be a smart decision. Lesson learned. You seem fully prepared to die for your work, how do you explain that about yourself? I don’t know. You can’t control how a polar bear or a leopard seal or how an animal is going to react. But you use common sense, you use research, you use your knowledge, your experience. You listen to your gut a lot. It’s not that I’m willing to die — I always say, “You can’t take pictures when you’re dead” — I do want to stay alive. But I’m good at what I do, and I’m very focused, and I just have a lot of experience. You know, where I am actually truly, truly terrified, where I am out of my comfort zone, where you can see panic in my eyes, is you put me into the streets of New York at 1 in the morning, on a Saturday night, and you will watch fear. I got attacked once in the subway station in New York. Because I was absolutely petrified. There was this huge guy, and he probably just picked up on my energy, pushed through a big crowd of people and grabbed me and threw me into the wall. When you’re that out of your comfort zone, you’re going to show fear. Is there an animal that you have not seen yet that you’re really dying to? Is there a kind of white whale out there that you’re dying to photograph? I’ve never been to the Arctic or any polar region. A part of me wonders about the smells or the sounds of it. What might people not realize about the sensory experience of being there? I’d say the sound is one of the biggest things. When you’re standing out there on the sea ice, where it’s just a blue sky and the water is calm at the ice edge. You don’t hear anything. It’s truly, truly the word silence. You’re just sitting on the Barren Lands, and you can’t hear anything. And again, when I freak out, I freak out in New York when there’s an ambulance and a fire truck and a jackhammer and people are honking and screaming. I’m so used to that silence and that solitude. I mean, I never turn on music, I never listen to music when I’m out there. I just love the sounds of being out there. The next sound might be a blizzard and the wind blowing 70 knots. And it sounds like a jet, you know? And then your tent is whipping. Or even the packed ice, or the sea ice rubbing against each other. It’s just really, really beautiful, that nature symphony. And in Antarctica, you get all that same thing, except it’s usually drowned out by the sounds of thousands of penguins. So with climate change, what have you witnessed with your own eyes. From being a child in the Arctic on Baffin Island to now, do you see a change and a difference? For sure. There’s so many different variables. I mean, the biggest one is, you used to see multi-year ice, and that’s ice that lives for many years. It’s ice that’s 10 feet thick, it’s extremely hard. So that’s the ice that’s disappearing. I mean, when I went through the Northwest Passage 18 years ago, we’re on Canada’s biggest icebreaker, smashing ice, and it was loud, it was aggressive. In just 18 years, people are now going through the Northwest Passage in little homemade sailboats. I was up there last summer on a friend’s boats that’s not allowed to touch ice, and we could go through all these places that we wanted to go because there was no ice. It’s that shocking. When I did a big assignment for National Geographic 15 years ago in Svalbard, Norway, we had to put that assignment on hold year after year because the story was to be out on the ice filming polar bears, and there was no ice. Even in the winter months there was no ice. And this was 500 miles from the North Pole. And then I have personal anecdotes where, I was working in Svalbard with a very good friend of mine, and I left and two days later he went to a place where he traditionally goes by snowmobile, and he went through the ice and he died, just because all the ice was gone. So ice is getting thinner and thinner every year. In places where you’re used to seeing walruses out on the ice, even up in the Beaufort Sea, now you’ve got 30,000 walruses packed up on land, where normally they’d be out floating on multi-year ice. There’s examples everywhere of this changing ecosystem. It’s changing very dramatically, very quickly. How overall hopeful or pessimistic are you about what’s happening in the Arctic? I’m sort of hopeful in a way that I feel like people are waking up around the world, they’re sort of starting to get it. I think Trump has actually been good in waking up the world, to realize they can’t just sit there waiting for politicians to do everything for them. But when I look at places like the polar regions, I get very worried. When you look at places like Miami, and they’re putting the $14 billion retaining wall around the city because of rising sea levels, and yet they’re still denying climate change. But there’s a lot of smart people out there working on really smart solutions. These things are happening, just not happening fast enough. And even if we did stop all carbon emissions tomorrow, the Arctic and the Antarctic will still suffer greatly, just because of the damage that’s been done. It’s not good. So yeah, I’m very fearful for what’s going to happen to the polar regions and the species that live there.